The campaign in Philadelphia had begun quite badly for the American forces. Washington and the Continental Army had suffered successive defeats at the Battle of Brandywine and the Battle of Paoli that left Philadelphia defenseless. After the seizure of the revolutionary capital by Charles Cornwallis on September 26, 1777, William Howe left 3,462 men to defend it and moved 9,728  men to Germantown, 5 miles (8.0 km) north, determined to locate and destroy the American forces. Howe established his headquarters at Stenton, the former country home of James Logan. With Howe's forces thus divided, Washington saw an opportunity to confront the British. He decided to attack the British garrison in Germantown as the last effort of the year before the onset of winter. His plan was to attack the British at night with four columns from different directions with the goal of creating a double envelopment. Washington hoped to surprise the British and Hessian armies in much the same way he had surprised the Hessians at the Battle of Trenton. Germantown was a hamlet of stone houses spreading from what is now known as Mount Airy on the north to what is now Market Square in the south. Extending southwest from Market Square was Schoolhouse Lane, running 1.5 miles (2.4 km) to the point where Wissahickon Creek emptied from a steep gorge into the Schuylkill River. Gen. William Howe had established a base camp along the high ground of Schoolhouse and Church lanes. The western wing of the camp, under the command of the Hessian general Wilhelm von Knyphausen, had a picket of two jaeger battalions at its left flank on the high ground above the mouth of the Wissahickon. A Hessian brigade and two British brigades camped along Market Square, and east of there were two British brigades under the command of Gen. James Grant, as well as two squadrons of dragoons, and the 1st Light Infantry battalion. The Queen's Rangers, a New York loyalist unit, covered the right flank. After dusk on October 3, the American army began the 16 miles (26 km) southward march to Germantown in complete darkness. As the attack was to occur before dawn, the soldiers were instructed to put a piece of white paper on their hat to identify friend from foe. They were not detected by the jaeger pickets, and the British and Hessian forces remained unaware that American troops were advancing on them. 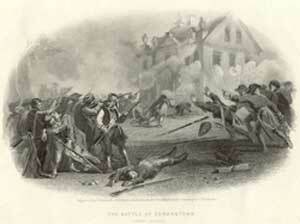 For the Americans, it seemed their attempt to repeat their success at the Battle of Trenton was going to succeed. The darkness made communications between the columns very difficult, and progress was slower as expected. At dawn, most of the American forces were well short of their intended attack positions, and they had lost the element of surprise. One American column, however, consisting of militia, had managed to reach the British camp. These troops halted near the mouth of Wissahickon Creek, firing a few rounds from their cannon at Knyphausen's camp before withdrawing. The three remaining columns continued their advance. The one under the command of General John Sullivan, moved down Germantown Road, the column of New Jersey militia under the command of General William Smallwood moved down Skippack Road to Whitemarsh Church Road and from there to Old York Road to attack the British right flank, and the one under the command of General Nathanael Greene, which consisted of Greene's and General Adam Stephen's divisions and General Alexander McDougall's brigade, moved down Limekiln Road. A thick fog clouded the battlefield throughout the day. The vanguard of Sullivan's column, on Germantown Road, launched the battle when they opened fire on the British pickets of light infantry at Mount Airy just as the sun was rising at around 5:00 am. The British pickets resisted American advance and fired their guns in alarm. Howe rode forward, thinking that they were being attacked by foraging or skirmishing parties. It took a substantial part of Sullivan's division to finally overwhelm the British pickets and drive them back into Germantown. Meanwhile, Gen. Nathanael Greene's column on Limekiln Road caught up with the American forces at Germantown. Its vanguard engaged the British pickets at Luken's Mill and drove them off after a savage skirmish. Adding to the heavy fog that already obscured the Americans' view of the enemy was the smoke from cannons and muskets, and Greene's column was thrown into disarray and confusion. One of Greene's brigades, under the command of Gen. Stephen, veered off course and began following Meetinghouse Road instead of rendezvousing at Market Square with the rest of Greene's forces. The wayward brigade collided with the rest of American Gen. Wayne's brigade and mistook them for the redcoats. The two American brigades opened heavy fire on each other, became badly disorganized, and fled. The withdrawal of Wayne's reserve New Jersey Brigade, which had suffered heavy casualties attacking the Chew house, left Conway's left flank unsupported. In the north, an American column led by McDougall came under attack by the Tory Loyalist troops of the Queen's Rangers and the Guards of the British reserve. After a savage battle between the two, McDougall's brigade was forced to retreat, suffering heavy losses. Still convinced, however, that they could win, the Continental 9th Virginia of Greene's column launched a savage attack on the British and Hessian line as planned, managing to break through and capturing a number of prisoners. However, they were soon surrounded by two arriving British brigades, led by Gen. Cornwallis, who launched a devastating countercharge. Cut off completely, the 9th Virginia Regiment was forced to surrender. Greene, upon learning of the main army's defeat and withdrawal, realized that he stood alone against the whole British and Hessian force, so he withdrew as well. Of the 11,000 men Washington led into battle, 152 (30 officers and 122 men) were killed and 521 were wounded (117 officers and 404 men). Over 400 were captured, including Colonel Mathews and the entire 9th Virginia regiment. Gen. Francis Nash, whose North Carolina Brigade covered the American retreat, had his left leg taken off by a cannon ball, and died on October 8 at the home of Adam Gotwals. His body was interred with military honors on October 9 at the Mennonite Meetinghouse in Towamencin. Maj. John White, who was shot at Cliveden, died on October 10. Lt. Col. William Smith, who was wounded carrying the flag of truce to Cliveden, also died from his wounds. In all, 57 Americans were killed attacking the Chew House. Gen. Stephen was later court-martialed and cashiered from military service when it was discovered he was intoxicated during the battle. Command of his division was given to the Marquis de Lafayette. British casualties were 70 killed (4 officers and 66 men) and 450 wounded (30 officers and 420 men). British officers killed in action included Gen. James Agnew and Lt. Col. John Bird. Lt. Col. Walcott of the 5th Regiment of Foot was mortally wounded.